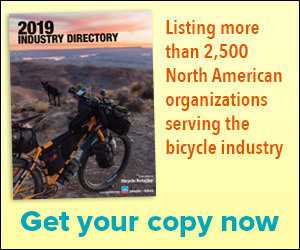 BAY SHORE, NY (BRAIN)—In keeping with a 20-year tradition of creating innovative marketing tools to support the efforts of its retailers, Finish Line now offers free-to-dealer hang tags like the one included in the March 15 edition of Bicycle Retailer and Industry News. CORONA, CA (BRAIN)—The Corona, California Jenson USA shop lost nearly $27,000 worth of high-end bikes in a burglary last week. ST. LOUIS, MO (BRAIN)—Retailers probably won't mind the dark morning rides into work if it means the extra daylight (DST starts this Sunday) translates into more cash in their registers. DENVER, CO (BRAIN)—Rudy Project will launch the “Rudy Project Gear Deal” this month. The innovative promotion will give dealers the opportunity to offer a $220 package that holds over $450 in value, making it an attractive deal for consumers in today’s economy. BERKELEY, CA (BRAIN)—Qualified transportation fringe benefits has expanded to allow up to $20 per month for bicycle commuters to spend on everything from new or used bicycles, to accessories such as lights and helmets to the monthly cost of a bicycle storage unit. PLAINFIELD, IN (BRAIN)—Endura has moved its U.S.-based operations from Berea, Ohio to Plainfield, Indiana. The warehouse in Indiana will further allow Endura to expand and grow its operations in the United States. BURLINGTON, MA (BRAIN)—Parlee Cycles and The Cycle Loft have formed an exclusive relationship offering high quality hand-built carbon fiber bicycle frames to the northwest of Boston and beyond. SANTA MONICA, CA (BRAIN)—Cynergy Cycles, a Specialized Concept Store in Santa Monica, California, has been sold to Sean Flynn, owner of Surf City Cyclery in Huntington Beach, California. ATHENS, GA (BRAIN)—Specialized has launched its first Georgia concept store with the opening of Cycle Sport Concepts. NEW YORK, NY (BRAIN)—This May Eastern Mountain Sports will open a new store in SoHo at the corner of Spring and Broadway that triples the size of its current Manhattan location, featuring an urban loft feel and green design aspects. BROOKLYN, NY (BRAIN)—The Trek Bicycle Store of Brooklyn, New York shut its doors on December 31, according to owner Joe Dweck. "The economy tanked us," said Dweck, adding that people weren't buying bikes. The store had been open for a year. NASHUA, NH—In the midst of a tough economy, retailers are dealing with yet another challenge: rising health insurance premiums. Small and large retailers alike are facing steeper premium increases, with both having to make tough choices for themselves and their employees for the new year. LAKE ARROWHEAD, CA (BRAIN)—Last week a robber stole more than $400 from Unified Ride Bike Shop on South Highway 173, according to the Crestline Courier-News. NORTH HAMPTON, NH (BRAIN)—Gus' International Bicycle Shop has reopened with a renewed vigor. The shop had closed in September after the death of its second owner, John Bocko. Click on link to see how new owner Jeff Latimer plans to give Gus' new life. NEW HAVEN, CT (BRAIN)—Less than a year after spinning off his popular Devil’s Gear Bike Shop near the Yale campus in New Haven, Connecticut, owner Matthew Feiner sold off the inventory and closed the second shop two weeks ago. Devil’s Gear II, as it was known, couldn’t survive the economic downturn. PAYSON, UTAH (BRAIN)—Delta 7 Sports finished its move to a new facility last week, giving the growing company three times the amount of space as its former building. ORANGE, CA (BRAIN)—Switchback Cyclery will shutter its doors next month, after falling victim to tough economic conditions, smaller margins and increased competition from the Internet. PALOS VERDES, CA (BRAIN)—Steve Bowen posed the question to his fiancée almost on a whim, he recalled. Should they buy a beaten-down shop better known for blowing out Schwinns than serving an affluent customer base?